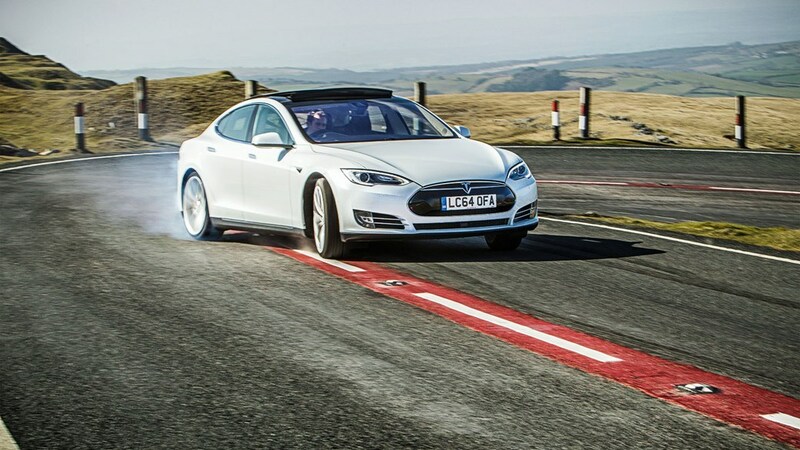 Tesla CEO Elon Musk has announced a new ‘Ludicrous Mode’ performance upgrade for the Model S P85D saloon. The optional enhancement raises the dual-motor P85D’s battery pack’s amperage and sees its 0-62mph time tumble to a belief-beggaring 2.8 seconds. Musk announced the optional upgrade in a typically mischievously worded statement on Tesla’s website, along with a series of further developments. They include plans for a successor to the Tesla Roadster sports car, an update on the progress of the upcoming Model X SUV and a further, separate battery upgrade to increase its existing models’ range. Ludicrous Mode: what is it? Ludicrous Mode follows in the footsteps of the previous ‘Insane Mode’ software upgrade, which improved the P85D’s 0-60mph time to 3.1sec. Its aptly named successor trims a further three tenths from the 60mph sprint and makes for a quarter-mile time of 10.9sec. Not bad for a 2.2-tonne luxury saloon – a Lamborghini Aventador Roadster takes 10.8sec. The package, which can be retrofitted to existing cars, comprises a new fuse design for the battery with its own separate electronics and tiny lithium-ion battery, to deal with a higher amperage than a standard fuse could cope with. Together with material changes elsewhere, the result is an increased maximum battery pack output from 1300 to 1500 Amps. It’ll cost $10k (£6429) for new buyers in the US, while existing owners get a half-price discount for the next six months. Tesla has concurrently announced a separate option for new buyers to upgrade the 85kW battery pack available in the single- and dual-motor Model S to 90kW, with the more prosaic aim of increasing usable range rather than performance figures. Intriguingly, the Ludicrous-spec drivetrain package will be one of the options in the upcoming Model X SUV. There’s unlikely to be a faster seven-seater out there. The Model X itself is on track for first deliveries in two months, says Musk. It’ll be joined by the smaller, cheaper Tesla Model 3 in just over two years, with a starting price pencilled in for around £22,700. Click here for more on the Tesla Model X and Model 3. The original Roadster was Tesla’s first production car offering, based around a battery-crammed chassis derived from the Lotus Elise. Earlier this year Tesla made a retro-fit battery pack available for Roadster owners, boosting the car’s optimum range from 245 miles to a potential 400. Click here to read CAR’s original Tesla Roadster review.